Hi there! 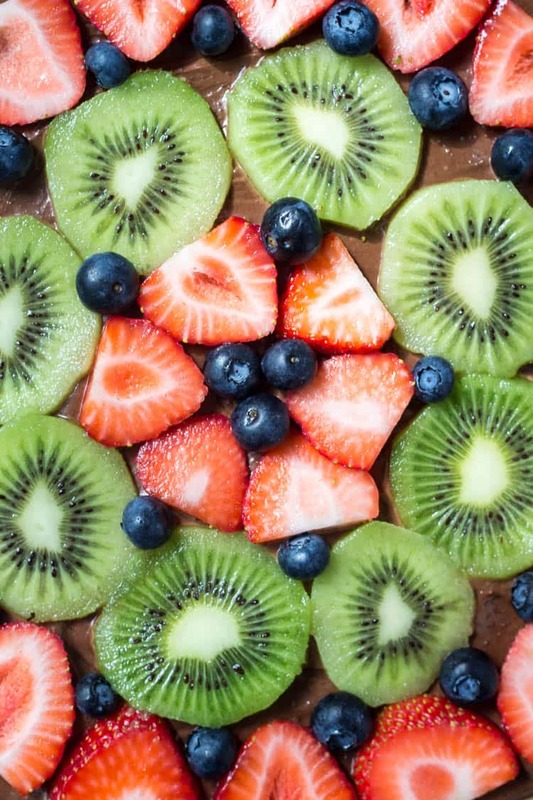 It’s Fiona from Just So Tasty – last month I shared M&M Granola Bars and today I’m stopping in to share this chocolate fruit pizza. It’s a big soft and chewy sugar cookie. 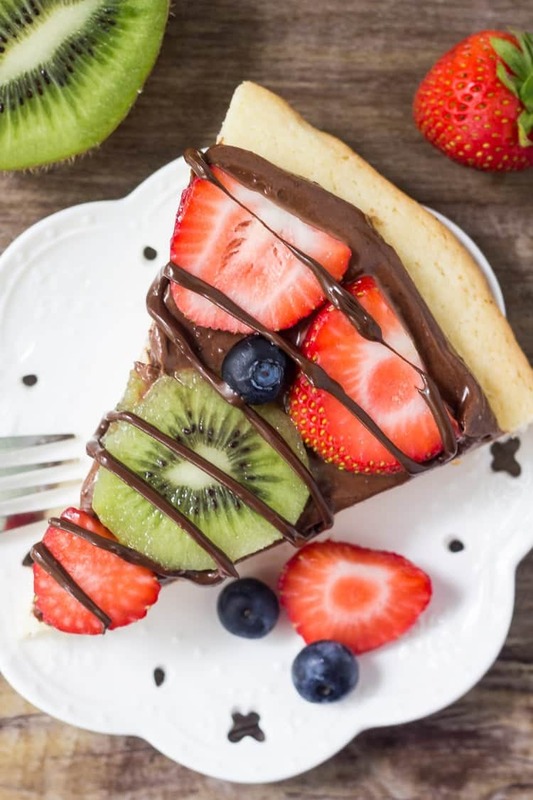 Then it’s frosted with a chocolate cream cheese topping and decorated with fresh fruit. The sugar cookie crust is thick, soft, and chewy for a few main reasons. First we’re using a combination of butter and cream cheese. This helps make the cookie extra soft and adds more flavor than if we were using shortening. Then a little cornstarch and cream of tartar keep it extra soft. After the sugar cookie dough is made, we’ll need to chill it in the fridge – otherwise the dough is too soft to roll out. Then we roll it out onto our pizza pan, and it’s ready to bake. Just be careful not to roll it out to the very edge of your pan. It’ll expand as it bakes, so if it’s already at the edge of the pan it can overflow. After the sugar cookie is baked and cooled – it’s time to make the chocolate cream cheese topping. It’s creamy, not too sweet, and has a delicious chocolate flavor. The chocolate cream cheese topping is made by beating together softened cream cheese and butter, then mixing in cocoa powder and powdered sugar. 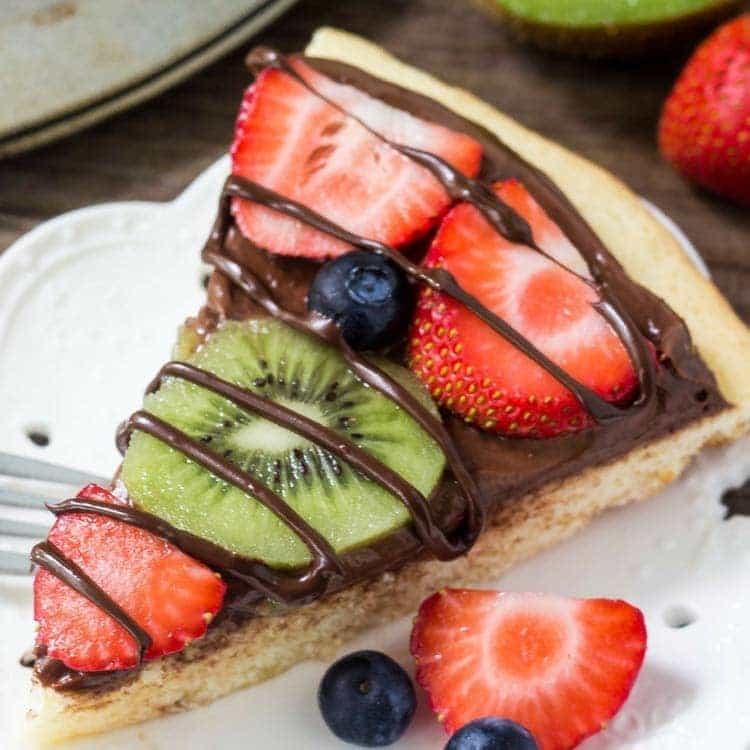 The topping is frosted onto the top of our chocolate fruit pizza, and then it’s time to decorate. Feel free to use use whatever fresh fruit you prefer – I chose strawberries, blueberries & kiwi – but it’s really up to you. Then a little drizzle of melted chocolate on each piece, and you’re ready to serve. 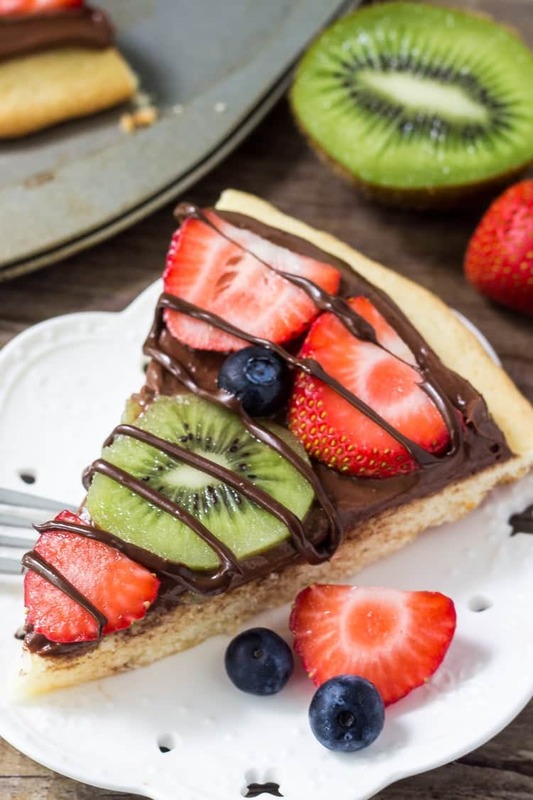 This chocolate fruit pizza is always a total crowd pleaser. With chewy sugar cookie, creamy chocolate cream cheese topping & fresh berries – you can’t go wrong! In a medium bowl, whisk together the flour, baking powder, cornstarch, cream of tartar & salt. In a separate large bowl beat together the butter and cream cheese using an electric mixer until well softened. Then mix in the sugar, followed by the vanilla & butter. With the mixer on low speed, carefully mix in the flour mixture until combined. Form the dough into a round disk shape, wrap in clingfilm and set in the fridge for at least 30 minutes. When ready to bake, preheat the oven to 350F degrees and line a round pizza pan with parchment paper. Unwrap the cookie dough and press it into a large circle on the the pizza plan, or roll it out using a well floured rolling pin. Do not roll out the dough to the very edges of your pizza pan - otherwise it can overflow while baking. Make sure to leave about 1/2 -1 inch around the edges of the pan. Bake in the preheated oven for 12-15 minutes, or until the top looks set. Allow to cool fully. In a large bowl beat together the butter and cream cheese until well softened. With the mixer on low speed slowly beat in the cocoa powder followed by the powdered sugar. Beat in the heavy cream 1 tablespoon at a time as needed. 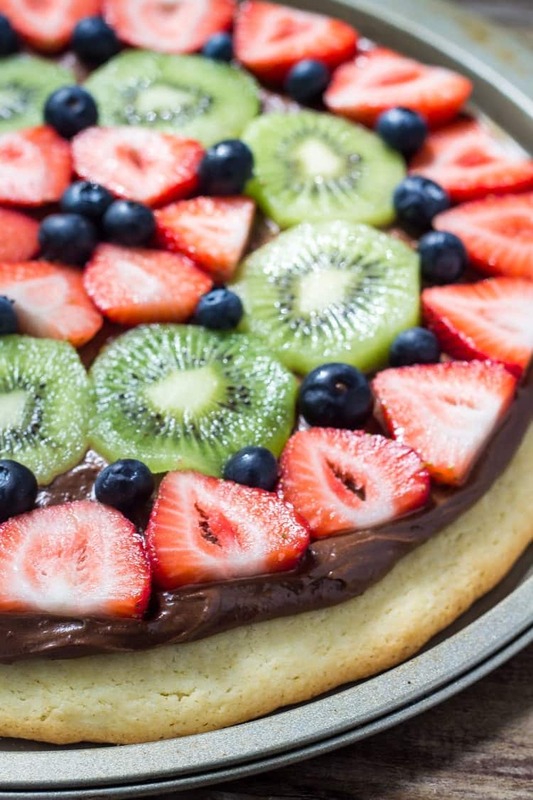 Frost the cooled sugar cookie with the chocolate topping, then decorate with fresh fruit. Melt the chocolate chips in the microwave on medium power for 30 second burst, stirring between each.